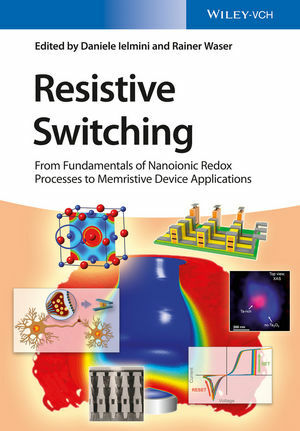 With its comprehensive coverage, this reference introduces readers to the wide topic of resistance switching, providing the knowledge, tools, and methods needed to understand, characterize and apply resistive switching memories. Daniele Ielmini is associate professor in the Department of Electrical Engineering, Information Science and Bioengineering, Politecnico di Milano, Italy. He obtained his Ph.D. in Nuclear Engineering from Politecnico di Milano in 2000. He held visiting positions at Intel and Stanford University in 2006. His research group investigates emerging device technologies, such as phase change memory (PCM) and resistive switching memory (ReRAM) for both memory and computing applications. He has authored six book chapters, more than 200 papers published in international journals and presented at international conferences, and four patents to his name. Professor Ielmini received the Intel Outstanding Research Award in 2013 and the ERC Consolidator Grant in 2014. Rainer Waser is professor at the faculty for Electrical Engineering and Information Technology at the RWTH Aachen University and director at the Peter Grünberg Institute at the Forschungszentrum Jülich (FZJ), Germany. His research group is focused on fundamental aspects of electronic materials and on such integrated devices as nonvolatile memories, logic devices, sensors and actuators. Professor Waser has published about 500 technical papers. Since 2003, he has been the coordinator of the research program on nanoelectronic systems within the Germany national research centres in the Helmholtz Association. In 2007, he has been co-founder of the Jülich-Aachen Research Alliance, section Fundamentals of Future Information Technology (JARA-FIT). In 2014, he was awarded the Gottfried Wilhelm Leibniz Prize of the Deutsche Forschungsgemeinschaft and the Tsungming Tu Award of the Ministry of Science and Technology of Taiwan.